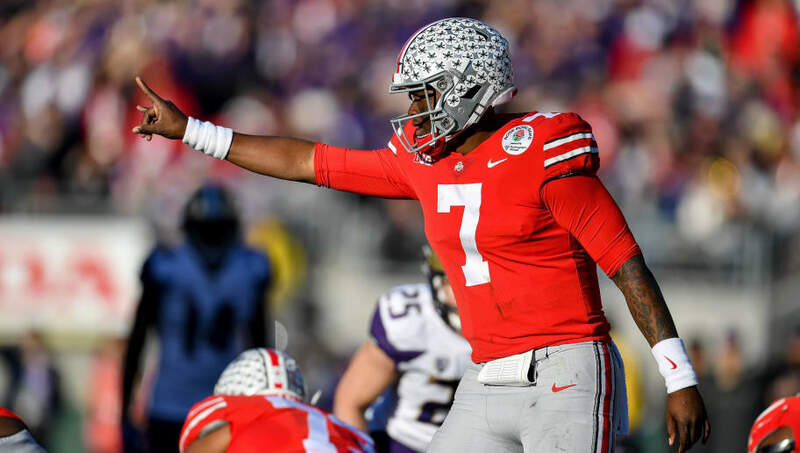 Two teams drafting in the Top 10 are reportedly already "in love" with former Ohio State QB Dwayne Haskins and after the combine, his stock will only rise. Synopsis: Dwayne Haskins was just a one-year starter at Ohio State, but it was quite an impressive year. Haskins threw for 50 touchdowns and nearly 5,000 yards (4,831) in Ohio State's quick-hitting offense. It was the perfect system for a player like Haskins, and he was able to flash his best traits: tight-window throws and quick releases. The biggest gripe about Haskins is his lack of mobility. Haskins did not handle pressure well either. The system he was in rarely put him in pressure, but he didn't effectively evade pass rushes with his athleticism to extend plays. This also shows up in his rushing numbers, as he averaged 1.9 yards per carry throughout his career. Haskins has exceptional arm strength and accuracy to excel at the NFL level. He has better NFL size than Kyler Murray and posted better numbers than Drew Lock. This all but locks him in as a first-rounder and likely the first quarterback taken off the board too. The Giants are the best candidate for him. They have tremendous athletes at the skill positions and their West Coast offense will get the ball out of his hands quickly. If they can shore up their line in free agency and through the draft, Haskins should have no problem succeeding as a rookie.